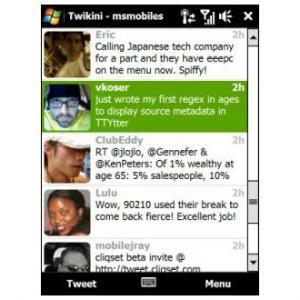 If you're one of those Twitter addicts who can't bear to be away from the service, then Twikini is the Windows Mobile app for you. This free Twitter client offers a quick and straightforward way to send tweets and check what your friends are up to, while you're on the move. Once installed, you just need to enter your Twitter account details into Twikini and the application will automatically import all of your data. The friends you're following are displayed in a clear timeline view in Twikini. This display can be customized, allowing you to change the font size, the name display, and the number of tweets that appear. You can even choose from a selection of cool themes to pimp your Twikini even further. Tweeting from Twikini is dead easy, thanks to a prominent 'Tweet' button that appears at the foot of the interface. Not only can you quickly type a message and post it, but you can also add your GPS location or capture an image from your PDA's camera and add it to your tweet. Version 2 of Twikini adds a smart new geo-tagging feature that lets you apply your location to your tweets via your GPS coordinates. You simply need to check the 'Geotag with GPS coordinates' option and your location will be included. Also added in this latest version of Twikini is support for the official retweeting feature in Twitter, plus the ability to view other people's Following/Followers lists. Twikini still doesn't offer you the full range of features that you'd find on the Twitter site itself, and the search options aren't as complete as they could be. As it stands though, Twikini is a clear, simple and fast Twitter client for Windows Mobile, which integrates neatly with your device's camera.